Van Sowerwine creates artworks that play with tensions between seemingly opposite forces such as light and darkness, danger and safety, the benign and the malignant. Her artworks use the symbols of play - populated as they are with dolls and cubbyhouses, peepholes and wind up mechanisms. The audience is enticed not only to look, but to touch. It's only once we begin to play, that Sowerwine turns the tables on us. Her toys become dangerous, her dolls lose their sweetness. 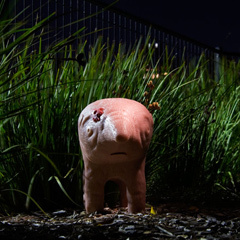 Small Beast, combines sculpture, video and photography. 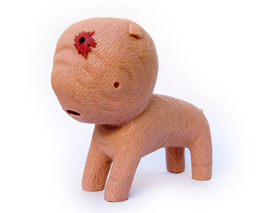 It features two creatures made from flesh-coloured plastic, suggesting both an organic and artificial origin. The animals are not taken directly from nature, and are both attractive yet slightly strange. Each sculpted animal is a little larger than a basketball, suggesting a 'pet-like' scale to be cradled and patted as an object of affection. The Small Beasts have peepholes in their sides inviting us to peer inside. They combine cute appeal with internal horror. Viewers are drawn into a relationship with the animals, and by looking into the peepholes are drawn even further into the animal's life. Inside each animal plays a stop-motion animation depicting their interior world. This makes the artworks not only an object but also a space. Theses creatures are simultaneously animate and inanimate, resulting in a sense of discomfort and uncertainty, combined with a strange attraction. On the gallery walls are photographs of the Small Beasts in various natural settings. The animals are shown as wild animals, in contrast to the sparse and controlled gallery settings in which they are seen. The photographs build up a narrative about the animals, creating an effect that is both comic and sad. The animals look both tough yet vulnerable in these settings, and the photographs build on the tension between the natural settings and the strangely unnatural animals. Sowerwine has exhibited widely both nationally and internationally. In 2006 her animated installation Expecting (with Isobel Knowles) was exhibited at the Institute of Contemporary Art in London and at FACT, Liverpool. In 2005 her solo show Sharper Than A Serpent's Tooth was part of the Melbourne International Arts Festival's visual arts program. Her previous work Play With Me was exhibited at the Art Gallery of NSW as part of the Anne Landa Award. Two of Sowerwine's works were shown at Media City Seoul 2004, the Korean Biennale of New Media Art. Her 2004 stop-motion animation Clara won a Special Mention at the Cannes Film Festival, Best Animation at the Chicago Film Festival and was an official selection of the Sundance Film Festival.